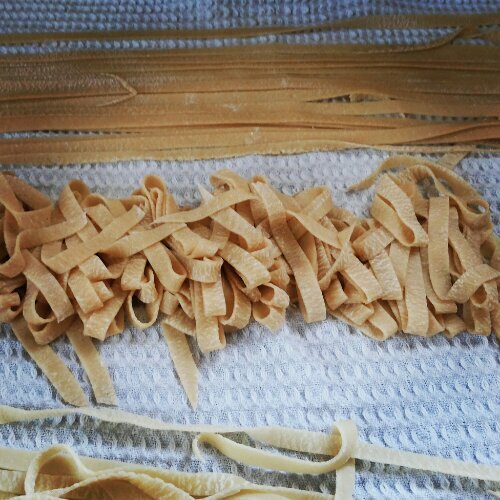 Who knew it could be so easy to make fresh pasta? I love pasta but am always a little put off by the fact that its almost always made of only all purpose flour and that there are so many preservatives in it. There are wheat variants available but I knew there had to be some catch to it. When I found out we had a pasta rolling machine at home, I was excited. I had to try it out! Making pasta at home?? Would that be difficult or easy? I began my research. It all came down to flour and eggs. Thats all. Nothing more needed. 1. Clean a table top and add both the flours on the table top. Mix them well together. 2. Create a small mountain of the flour and make a well in the middle. 3. Break both the eggs in the center of the well. 4. Slowly incorporate the eggs in the flour to make stiff dough. 5. If the dough feels very dry and cannot be completely bound with just the eggs, add one tablespoon of water at a time to ensure a stiff dough. 6. Knead the dough very well for 10 minutes. The more you knead the dough, the better will be the consistency of your pasta. 7.Pasta dough is much drier than any other dough so ensure you don’t make it very wet. 8. Cover the dough with cling film and allow the dough to rest for at least an hour. 9. Once the dough has treated well, knead it again. 10. Cover the table top with some flour and roll the dough into a shape thin enough to go into your pasta machine. 11. Run the dough in the pasta machine till it has reached its thinnest sheet. 12. Using the cutter attachment in your pasta machine, cut the pasta into the shape you prefer. 13. Once the pasta has been cut, if not using immediately, dry them by laying them out on a clean piece of cloth for about 3 hours. 14. To cook this pasta, heat a large pot of water with enough salt. 15. Allow the water to come to a rolling boil. A rolling boil ensures that the pasta doesn’t stick to each other. 16. Add the pasta to the boiling water and allow them to cook for at least 6 minutes. Check after 6 minutes to see if they are done. 17. Once done, drain the water from the pasta and add it to your favourite sauce! We loved this pasta and S kept saying that it tastes sweeter and fresher than regular,dried pasta. The pasta didn’t feel heavy and we enjoyed mixing it with a pesto sauce and a fresh pomodoro sauce! Enjoy a lovely Italian meal with your family tonight!! Hi Alex! Its delicious and tastes a little sweeter than regular pasta. Do let me know how it turns out for you! 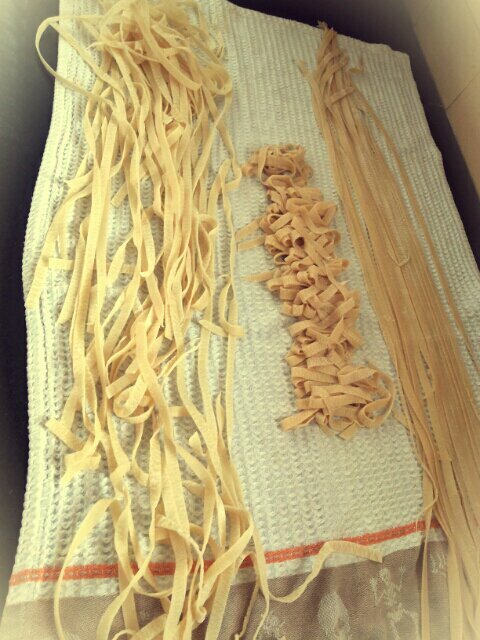 Homemade pasta is such a treat, really nothing can compare. I’ve never tried it with whole wheat flour before, that’s something I’ll have to add to my list!